It's no secret that obtaining multiple quotes from Louisville auto body repair shops or collision repair facilities is the best way to make the auto body repair experience a less expensive venture. However, less is rarely ever more. Here at the "Body Shop Guys, we believe maintaining the value of your vehicle post repairs, and driver safety, far outweigh getting the lowest price possible. Let's review some basic best practices on how to go about choosing a body shop or collision center. Typing in a simple phrase like “Louisville Body Shops" or "Body Shops Louisville KY" will yield a sizable selection of review-able Louisville based collision centers and body shops. In addition, the Internet allows their previous customers to leave reviews about their experiences. You can even find directory sites that have local Louisville addresses in their databases. One shop may find problems another misses. Multiple estimates will identify a "Low Ball Estimate"
Due to KY Law 304.12-275 Claimant's right to repair facility of choice. You're not limited to who your insurance company likes. 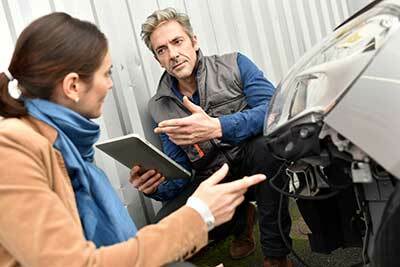 Find the auto body shop that's best for you, and use them. Beyond getting a written estimate you need to ask certain questions to know if you're really dealing with a good shop. For instance, do they have a written warranty on their work? You’ll want to make sure that it covers both materials and labor. Will they take pictures throughout the repair process to assist in your future Diminished Value claim? If they are charging the insurance company for masking or set-up time, which is owed to them; whether they are a preferred shop for X insurance company; or if the insurance company is paying them a fair labor rate? All of these questions are important because it comes back to the time, energy, and passion put into repairing your automobile. The less money and time the at fault drivers insurance company gives your shop of choice, the less likely you are to receive a quality repair. Are they ASE certified in the field of auto body & collision repair? Lastly, ask about their use of OEM (original equipment manufacturer) or after market parts. Don't ask if they use factory parts... All parts including after market parts are made in factories. Look at it this way, whether a parts manufacture makes new fenders in a factory, or in a garage at home, they can call them “factory made”. Text us at 502-890-9114 today to schedule a free consultation.